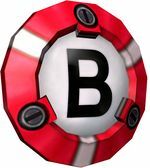 The Smart Bomb is an item found in the Star Fox games, and appears in Super Smash Bros. Brawl, Super Smash Bros. for Nintendo 3DS / Wii U, and Super Smash Bros. Ultimate. When the item is thrown or attacked, it explodes on the spot, dealing constant damage to any players caught in the expanding explosion, and finally dealing knockback as it disappears. Unlike in the actual Star Fox games, the Smart Bomb does not possess the homing abilities. On occasion, the Smart Bomb fails to explode, indicating by their distinct sound and failure to detonate, and it simply lies on the ground until, finally, it explodes unexpectedly. Players can still pick up a failed Smart Bomb and throw it, and it does not detonate while the player is holding it. However, if a set amount of time passes, the bomb explodes as soon as the player throws it. In Super Smash Bros. for Nintendo 3DS / Wii, the bomb always explodes the second time it is thrown, unlike the failed Smart Bombs in Super Smash Bros. Brawl, where it explodes only after a set amount of time or if it is attacked. Some Smart Bombs require to hit the ground to explode, seen occasionally when thrown upward, as regular Smart Bombs are thrown a set distance depending on the throw power before they explode. SNES Star Fox A bomb that explodes and causes damage to all characters within its range when thrown or attacked. The explosion from this device is so large, the deployer may be caught in the blast if he or she is not careful. In Star Fox, this item will explode after a set time or can be set off immediately with a button press. N64 Star Fox 64 (07/1997) Attack or throw this bomb if you want to make a big impact on the battle. The explosion just grows and grows, and despite the "smart" name, this bomb will hurt the thrower too! Sometimes you may throw what turns out to be a dud, but don't go hitting it in anger–it'll still go off in your face! Throw or hit this to set off a devastating explosion. The blast radius is so wide that your foe will have almost nowhere to run. Unfortunately, the same goes for you, so move fast! Sometimes they don't explode when you throw them, but if you hit them - even by accident - they definitely will! This page was last edited on March 14, 2019, at 01:18.